College Writing Skills with Readings 8 Edition College Writing Skills with Readings offers students a practical guide to becoming better writers. From mastering the traditional five-paragraph essay and its variations to learning about the finer points of grammar and punctuation, College Writing Skills with Readings empowers students to take control of their writing and put it to work for them. 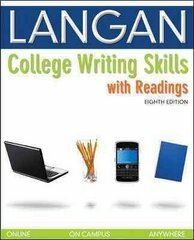 Now, with the new online writing program Connect Writing and the soon-to-come Connect Langan, an online interactive version of College Writing Skills with Readings, this new eighth edition brings writing closer to students and helps to take them where they need to go. Whether online or in class, College Writing Skills with Readings offers students the tools to succeed.